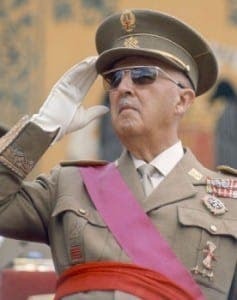 SPAIN’S former fascist leader General Franco will finally be officially recognised as a dictator. The Royal Academy of history will recognise the Franco regime as a dictatorship for the first time after decades of campaigning by relatives of his victims. The director of the academy announced that the official biography of the fascist general will be altered so that he will be labelled as a ‘dictator’. The current edition of El Generalisimo, published in 2011, describes how Franco ruled as an ‘authoritarian, but not totalitarian’. When published, the biography – written by professor Luis Suarez – sparked outrage. 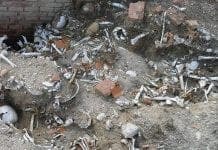 Over the past five years, campaigners have lobbied for it to be amended and to include the atrocities carried out under Franco’s rule. 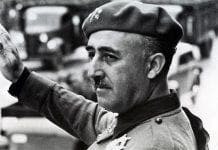 Although specific amendments were not mentioned, Carmen Iglesias, the new director of the academy said that the digital version of the biography would shortly be amended to describe Franco as a ‘dictator’. The fact that so many spaniards try to hide the fact that they had a dictator (& supported him, & commited atrocoties, & wanted facist rule, etc) does infact give me hope for the country. It means most spaniards know it was all very wicked, evil and something to be truely ashamed about. Thats the way forward to recovery. Perhaps they should try a S.African style Truth and Reconcilliation Tribunal… at least we’d find the stolen babies. I understand why so many supported this horrible dictator, they feared for their family’s & own lives. Now they no longer fear a leader, I’m sure they will make sure no one will run them like that again. complete rubbish. You need to spend some time reading Spanish history. The living conditions for the vast majority of Spanish workers and peasants was truly appalling, that’s why they voted in anarchist,socialist and communist MPs. The scum who supported Franco were the ones benefitting from the virtually slave labour wages and for many peasants in the country they were paid nothing but given what the landowner thought they should have. 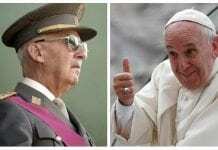 The old Fascist families still run Spain via control of the Guardia Civil/Policia Nacional and the Army/Navy and Air Force and all the big commercial enterprises – Opus Dei is an octopus that holds most of this extreme right wing together.